An Elk Grove probationer was arrested yesterday morning after he was seen attempting a residential burglary. 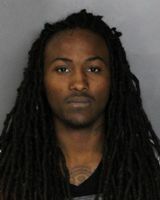 According to Elk Grove Police, a witness saw 26-year old Walter Coleman attempting to break-in to a residence. With the aid of a K-9 unit, responding officers established a perimeter and began a search. As officers were preparing to inspect the residence on the 4900 block of Percheron Drive, the suspect exited from a sliding glass door and jumped fences in an effort to escape. Officers were able to apprehend Coleman as he attempted to flee on foot in the 9800 block of Paso Fino Way. The suspect was arrested and a body search led to the discovery of property stolen taken during the burglary. A probation search of Coleman's residence led to the discovery of additional stolen property that had been taken during a residential burglary. Coleman is in custody at the county jail and is not eligible for bail. How many taxpayer dollars were wasted and will be wasted on this douchebag? Not only did they spend money chasing him down, they had to close down / lock down the elementary school. Great job! Thank goodness Elk Grove can respond so quickly. Thank you for your service. The dog should have bitten off the dude's family jewels so he can't breed in the future. up the items then placed them in a bag. After the items were bagged, S-1 grabbed the bag and ran towards the exit. Another employee blocked S-1 as she attempted to exit the store. S-1 pulled out pepper spray and sprayed the employee. S-1 then exited the store and was last seen getting into a dark colored vehicle via the passenger side door. S-1 was described as a BFA, 40's, dreadlock hair style, wearing a denim jacket over a white knee length dress. The employee was not injured during the incident. This young man is innocent until proven guilty.